Laser etching is a relatively new technology that is becoming more and more popular with the families we work with. 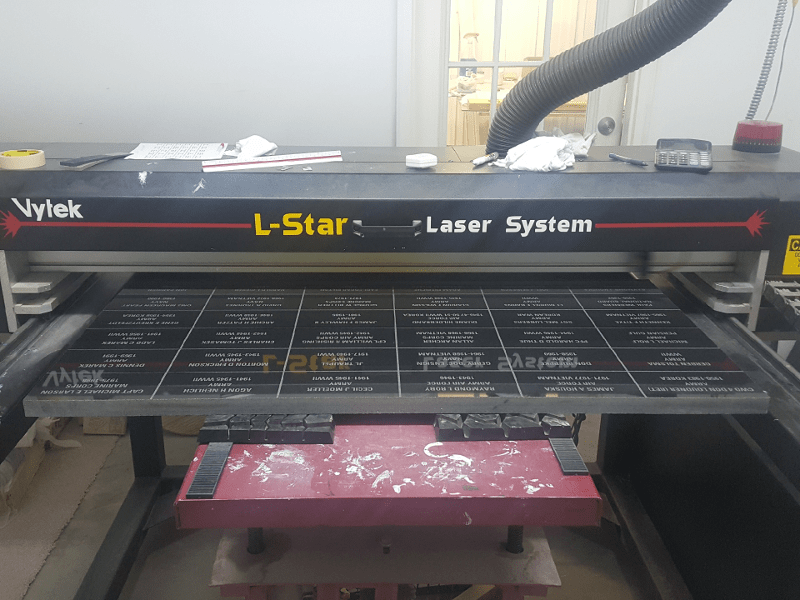 Using our state of the art laser etching machine allows us to place photo-quality images onto your stone. Many people choose to use a laser to capture portraits of their loved ones, aerial views of their family farm, their favorite classic car, just to name a few of the most common types of lasers we see. Realistically, as long as we have a clear, high-quality image to work from, we can laser, literally, anything onto a stone. Click here to see a full gallery or our laser etching work. 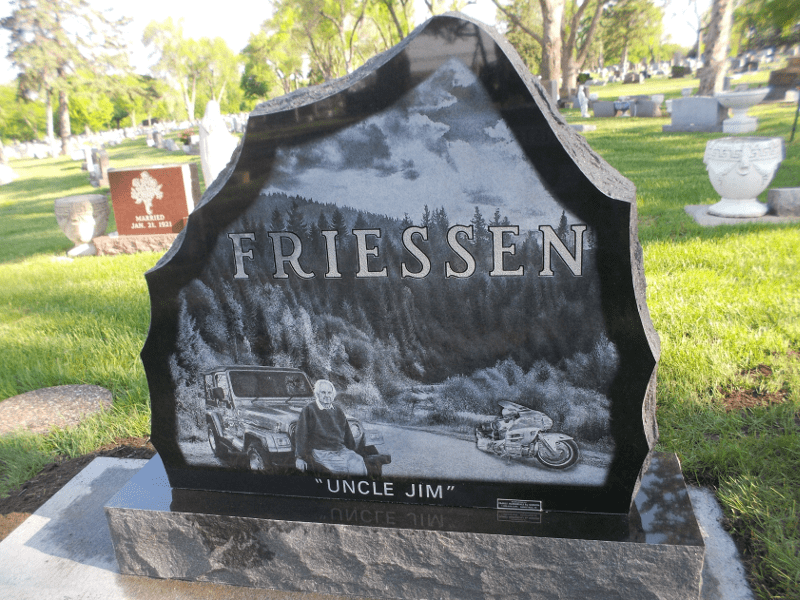 As long as we have a high-quality image to work from, we are able to laser high-resolution images onto your stone. This provides a stunning level of clarity on the stone, whether it’s a twinkle of an eye captured in your favorite photo or the slightest detail of your favorite piece of art. 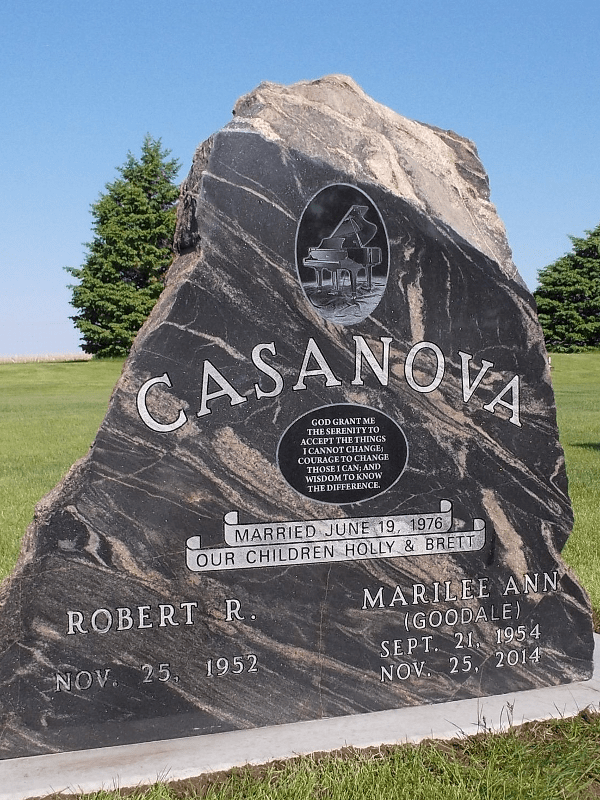 Because the laser is essentially “blasting” the polish off of the stone, the image will remain crisp and visible as long as any other lettering or carving on the stone. That is to stay, it will far outlast anybody reading this! Laser etching technology allows us to bring the entire realm of graphic design and photo-editing software into the fold. This means if you can think it, we can probably do it. Some people even choose to do their entire stone using our lasers. We will only laser on solid black stones. We find that using this technology on any other color of granite, even dark gray, does not create enough contrast for the lasered image to look good. Therefore, as a matter of quality assurance and only producing top quality work that will look good for centuries, we only laser on solid black colors of granite. Note: It is still possible to utilize a laser image on stones other than black if we put a black granite insert into the stone. See the image to the right as an example. If we are working off of photos provided by our customers, it is necessary for them to have a relatively high resolution. Simply said, low-resolution images will look blurry…and that is something no one wants! What is actually taking place when the high-powered laser comes into contact with the polished surface of a stone is incredible. The laser is fine-tuned to focus all of its energy right on the polished surface of the stone. The heat of the laser causes the polish to “explode” leaving behind an unpolished dot at that precise location. Each laser image is made up of hundreds, thousands, or even millions of these tiny dots! Essentially, our laser machine is a super-fast and precise pointillism artist! 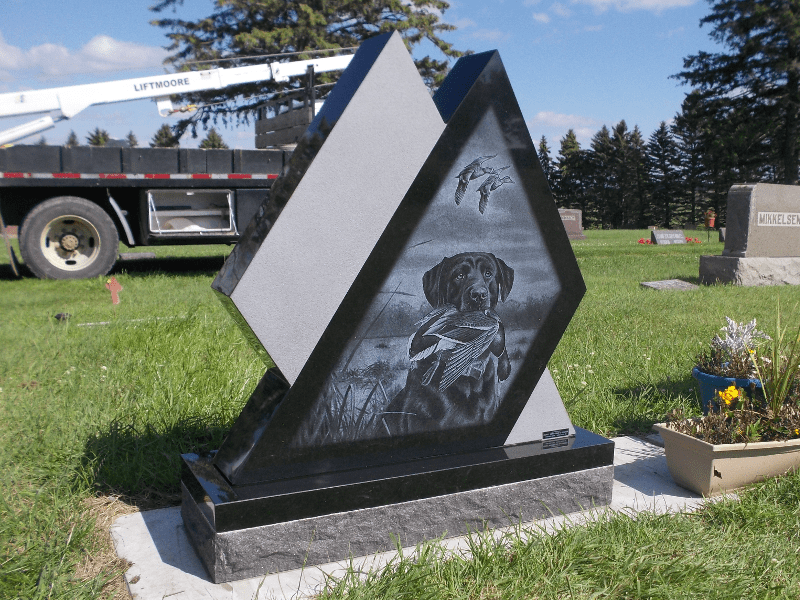 If a laser-etched image is something you might like on your stone or the stone of a loved one, please don’t hesitate to reach out to us! Our monument experts and artists love working with our customers to create beautiful images that will be captured in stone for centuries to come!